So first we just bought collectibles. Then we auctioned collectibles on ebay. Eventually we started a website for collectibles. Now it was time to move on and get a case at one of the Flea Market Antique Co-op buildings. Another venue to get rid of our collectibles and unwanted stuff. The first thing was contact the co-op and see what we had to do. We had to get our name on a waiting list, the place has enough case space for 1000 vendor and we still had to wait, are you kidding me. 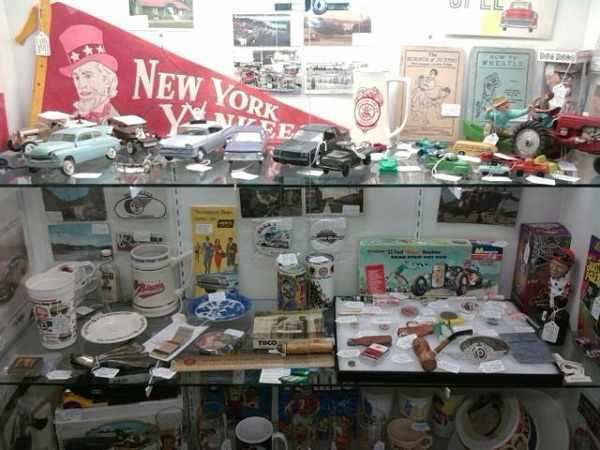 Once we got our name on a waiting list, we had to start sorting through some of collectibles and other stuff and start deciding what needed to go there, what had to be cleaned up, then find the value of the collectibles and price and label and log all the items. We didn't want to over do the big items since the case gives you limited space. It has a few shelves and that's it, and it's enclosed in glass, so planning ahead seems to help with the display. We finally get a call that a case has opened up, so we make sure everything is labeled and priced the way their directions sheet said the tags had to be labeled. Dealer number, Item price, Item description and price on the back of the tag, in case the tag (some were the ones attached with strings) flipped over, so people know the price, peering through the locked glass. If someone wants to purchase or look at an item in the case, they have to find one of the workers there so that the worker can unlock the case and get the item for you. When you are done looking they either put it back or bring it up front for purchase and lock the case back up. They also have sales it looks like once a month with a percentage off of the marked prices. So you kind of don't want to price your collectibles to low then when the sale time comes it's going to sell for even less. You can also put a sign on your case stating certain items 15 percent off, like top shelf, or anything marked over $10.00 or everything in the case. So anyways we go there with our boxes of collectibles, glass items wrapped and protected in some way for transport. Then we find a worker to come unlock our case, then we start trying to decide what to put where. My husband is 6' 3" and I'm 4' 11" so it's actually a good thing because we saw the case from totally different perspectives lol. We put all the stuff in the case, then looking at it you start rearranging. You notice the bigger and taller stuff should be in the back and smaller stuff in front. Making sure every tag is visible from a buyers perspective. Then after a bit, I'm looking at the case and notice something. Being short, anything on the top shelf that was flat like paper or patches or just plain small, I couldn't see them, I was too short. My husband being tall could see everything just fine. So I had to let him know that being vertically challenged I'd never buy anything off the top shelf because I could hardly see anything up so. So now we had to rearrange again, putting taller more visible stuff on the top so someone near my height would be able to see it. After we redid the top shelf which of course meant redoing all the shelves we looked again. I could now see everything and we took a picture or two. Now the co-op requires you return often to replace and keep items in the case changing. They advertise constantly changing items so we are required to go and remove stuff that doesn't sell and add new things. Guess what, it's more work than we originally anticipated. Hopefully it will be worth it. We also have a business card for our website in the case and some in a pocket above the case, kind of another venue to advertise.